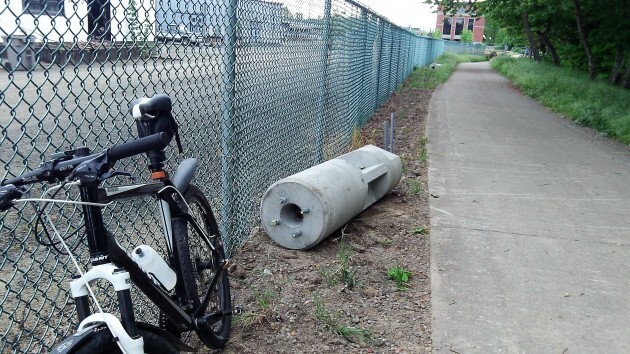 Those mysterious chunks of concrete lying along the Dave Clark Path on Albany’s riverfront are no mystery at all when you remember that a contractor is working to install lighting all along the trail. These are the bases or pedestals on which the 16-foot lighting poles will be mounted. They have helpful labels, too, telling the curious passer-by that they are made by a company in Wilsonville and weigh almost 1,400 pounds each. Signs on the path explaining the lighting project say it’s to be completed by June 1, but the city told me in March they expected it to be done by the end of June, which seems like a more realistic timeline considering the status of the work. Underground electric wiring was installed beginning at the end of March. 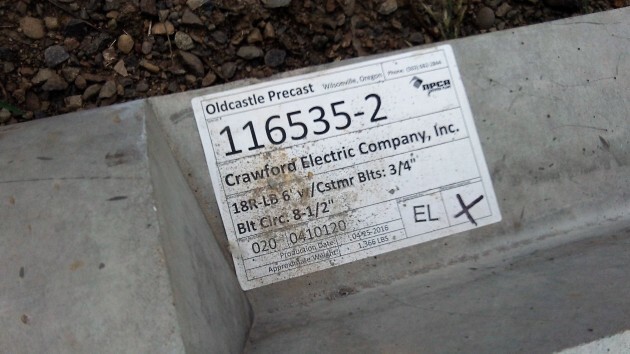 Crawford Electric of Stayton has the $298,008 contract to install the lights, funded as an urban renewal project by the Central Albany Revitalization Area. Yes, please keep up the good work even if some of the commenters ….get tiresome. To echo Mr. K., please more video. Now if bedtime is an issue simply wait till fall when the lights are in prime operating state. Even better, delay until the time change. That needless time switcheroo. HH, completely agree! Only down side I see may be leaves on the trail. So, ride safely.